After 24 hours of travelling, we finally land on Mahe. We expected the airport to be a tin shack, but actually it was fairly modern. As instructed we went over to the "residents" queue as we had a Gainful Occupation Permit (GOP); all the millionaires and honeymooners stared at us, a little bemused that we were residents. You could even hear them muttering about us as they endured the hour-long custom's queues-an early introduction to Seychellois bureaucracy! Captain M, our headteacher had made our landing and customs clearance quite a breeze. The sign above pretty much sums up the Seychellois/Saselwa way. A pretty seriously topic is trivialised and at the bottom of the sign "Thanks". The only thing missing was a Harvey Ball smiley face. As we had time to kill, Captain M took us around Mahe island, health and safety procedures are unheard of so we rocked out in the back of the pickup truck that his artist friend had kindly lent us. 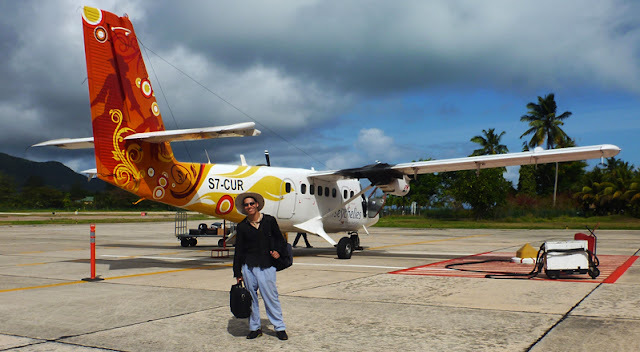 Seychelles transportation is a winner, except the Catamaran, we'll get to that in a later post. We were brought over to Eden island which is a multi billion pound development built by the Rt Hon. Mr Vijay Patel (he is also our school's founder/benefactor/sponsor- he is not a reverend, but he is right and honorable). I digress, back at the restaurant on Eden island, I went for the local tuna and mango salad. Needless to say it looked and tasted delicious and the price was pas mal also. Here's the marina at Eden island. That's all for Day One.